The other day while I was making bread dough for cinnamon rolls, I cut off a piece to try making a calzone. It was a delicious spinach and cheese calzone that you can see here. Then a friend and I were talking about forming an official Tuna Melt Association, so I had to try it in a calzone. It is delicious! I used bread dough made in my bread machine again, but a thinner crust, such as a pizza crust is usually what is used. 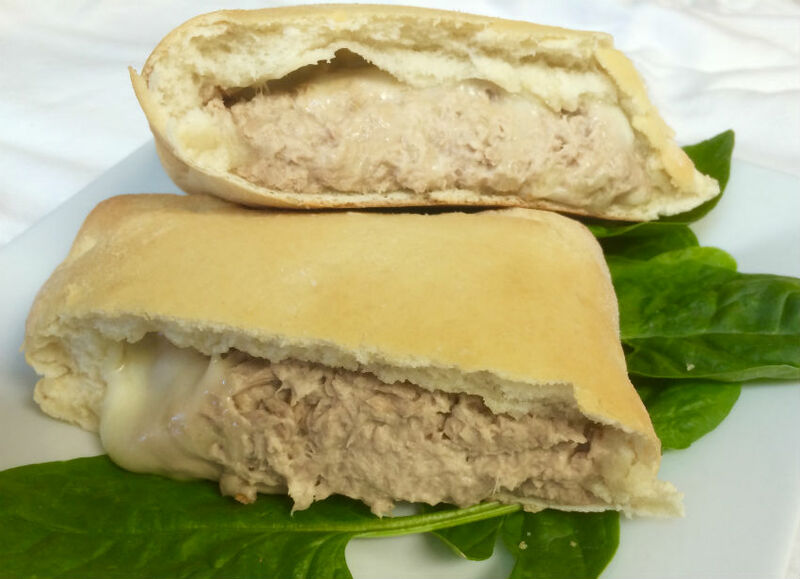 If you want to use regular bread dough, you will find my favorite recipe the the Spinach and Mushroom Calzone recipe above. This time I’ll include the pizza dough recipe. If you don’t have time—or a bread machine—you can use a packaged pizza crust. Simply cut it in half as you would the prepared dough. It surprising how fun and easy calzones are to make. Perhaps the most popular are the Italian favorites, with pepperoni and salami, or the meatball and provolone combination. Both would be a cinch once you have the dough prepared. Place all dough ingredients in bread machine pan in order recommended by manufacturer. Set on the dough cycle. When done, remove with lightly floured hands. Using a little extra flour as needed for handling, knead 5 minutes. Cover and allow to rest for 10 minutes. Grease cookie sheet or use parchment paper to line pan. Mix drained tuna with mayo and ½ of the cheese. Flatten and shape dough into a circle about 13 inches in diameter. Divide tuna mixture onto one half of each piece. Fold the top over the tuna mixture, pinching the edges until firmly secured. Note: Prep time does not include time for dough. That takes around 2 hours. Here are my two favorite things for baking. The Panasonic Bread machine, and Kirkland’s parchment paper. Essentials in my test kitchen. The parchment is used for everything from bread making, pan lining, to grating and chopping. It makes an excellent clean, flat surface. I love the Panasonic SD-YD250 bread machine. I get so much use out of it. Bread, of course, hamburger buns and rolls, cinnamon rolls, pizza dough, even pasta dough. I can be doing other things while it stirs, kneads, and raises the bread dough. A huge benefit to me is the yeast dispenser on the lid of the machine. Load it up, and it dispenses it into the machine at the proper time. No need to wait around for a beep to tell you it is time to add it. So easy. Here is my review of the Panasonic SD-YD250.